Welcome here! I want to show you the Types of Sentences in English with Definitions and Examples. The sentence is the largest grammatical unit there is in the English. Sentences comprise clauses and clauses comprise phrases or groups. Groups or phrases comprises words while words comprise morphemes. The morpheme is the smallest indivisible but meaningful grammatical unit we have in English. There are ways in which sentences in English have been arranged. The roles sentences play in utterance determines their arrangements; this arrangement has to do with types of sentences based on function. Another way we organize English sentences is on the basis of their structure or the way they appear; this is types of sentences based on structure. The sentence in English has various definitions but we shall examine it from four different perspectives. These include: the orthographic, semantic, grammatical or syntactic and the phonological levels. At the orthographic level, we can describe the simple sentence as a group of words that is usually marked in writing by the following punctuation marks: question mark, full stop, exclamation mark or in some cases semi-colon. From the semantic level, a sentence is a group of words that must be meaningful in context. In other words, a potentially complete stretch of utterance will be, as a whole utterance, meaningful within the situation in which it is uttered. At the grammatical level, we can define a sentence as a group of words that contains at least a predicator. The sentence is the largest unit of grammatical analysis as well as the upper limit of structural statement at the grammatical level. From the perspective of phonology, we can describe the simple sentence as a stretch of speech that one utters with a complete intonational tune preceded and followed by silence. (See the post on Definitions and Constituents of the Simple Sentence). A fragmentary sentence is an incomplete statement, or phrase or a subordinate clause punctuated as a complete sentence. A fragmentary sentence is one that is fragmented; that is it consists of fragments; it comprises broken off and detached parts. It occurs in our speech where it makes sense as responses to what someone has said or as addition to what we have already said. In other words, it is a sentence that that expresses a thought or idea that is not complete. A sentence is fragmented also, when major syntactic elements of the sentence are missing. A fragmentary sentence is likely to be a fragmentary idea to be finished or added to another idea and we can correct it by joining it to another sentence or by supplying the subject and a predicator; that is, converting it to a full sentence. Despite missing out on the major constituents that make up a grammatical sentence, a fragmentary sentence is not wrong or ungrammatical. Some scholars refer to a fragmentary sentence as sentence fragments, minor clause or abbreviated clause. Fragmentary sentences could also manifest as phrases, incomplete clauses, dependent clauses or as standalone sentences. A simple sentence consist of only on main, alpha or independent clause. A main clause is one that can stand on its dependent counterpart, the subordinate clause. The arrangement of the simple sentence encompasses syntactic elements such as the subject, the predicator, the complement and the adjunct. But the only compulsory element of these four is the predicator. The length of a sentence has nothing to do with its classification as a simple sentence. That a sentence is short does not necessarily qualify it as a simple sentence. A sentence could be short and not be a simple sentence while another may be very long and still be a simple sentence. (See more on Types of Sentences According to Structure). I am constrained to make this an open letter to you for a number of reasons. And no group solely by itself can crown any of its members the Nigerian CEO. It is now not a matter of the turn of any section or geographical area but the best interest of Nigeria and all Nigerians. An interrogative sentence, based on its name, is a sentence that interrogates. In other words, it asks different types of questions and a question mark usually follows it. Check the post on Types of Sentences According to Functions for the possible types of questions an interrogative question asks. Should we pursue war against violence without understanding the root causes of the violence? What does the former president want? Is he being recruited to do for you what he had done for the dictator in the past? Where were they when God used others to achieve His will in your life? You will be present when the award is given, won’t you? A compound-complex is a sentence contains two main clauses and one or more subordinate clauses. Both the coordinating conjunction and subordinating conjunction are present in this type of sentence. I personally have done two out of those three sacrifices and I am ready to do the third if it will serve the best interest of Nigerian dream. We incurred the displeasure of ethnic chauvinists for doing what was right for the country and that is in the nature of burden of leadership. I have always retorted that God only put you where you are and those that could be regarded as having played a role were only instruments of God to achieve God’s purpose in your life. It would be unfair to continue to level full blames on the Chairman for all that goes wrong with the Party; the Chairman is playing the tune dictated by the Paymaster. The type of sentence comprises three distinct main clauses which are independent of one another without any dependent clause. We, as a Party, should applaud and commend him and Nigerians should reward and venerate him. I cannot comment much on the constitutional aspect of your second term or what some people call third term but that is for both legal and judicial attention. A leader must cherish and hold dear among others trust and honour; these are important ingredients of character and anyone in the Office of the Presidency of Nigeria must be a man or woman of honour in their words and character. I kept you fully briefed at every stage and I deliberately chose the venue and your aides studied all the recordings of the two nights. A minor sentence expresses a complete unit of meaning albeit without the presence of a verb; that is it omits one of the structural elements like the subject, predicator, or even complement. Check out the post dedicated to Minor Sentence for more explanations on its definitions, types and examples. This is just an extension of the multiple sentence with the addition of at least, one subordinate clause. In other words, it is a sentence that has at least three main clauses and at least, one dependent clause. For five capacities in which you find yourself, you must hold yourself most significantly responsible for what happens or fails to happen in Nigeria and in any case, most others will hold you responsible and God who put you there will surely hold you responsible and accountable. I have seen them with you and some were around me when I was in your position and I knew how not to allow them create enemies for me because if you allow them, everybody except them will be your enemy..
Those positions go with being the President of our country and while depending on your disposition, you can delegate or devolve responsibility, but the buck must stop on your table whether you like it or not. I worked for them because they could strengthen the unity, stability and democracy in Nigeria and we incurred the displeasure of ethnic chauvinists for doing what was right for the country but that is in the nature of burden of leadership. This sentence, among other things it does, makes a statement, states fact, expresses hope, wish or prayer, informs, supplies ideas, educates and declares as the name goes. It happened in Lagos in 2011 when he was nocturnally brought to Abuja to strike a deal to support your personal election. I wish to see no more bloodshed occasioned by politics in Nigeria. You can do it and I plead that you do it. A compound sentence comprises two independent clauses with no subordinate clause. That is, the two clauses that make up a compound sentence are main or alpha clauses which can stand on their own separately from the coordinating conjunction that joins them. (See Coordinators and their Semantic Implications). These dangerous emotive issues can ignite uncontrollable passion and can destabilise our dear country. Let me appeal to those who have embarked on this dangerous road to reflect and desist from taking us on a perishable journey. One of the truest test of integrity is its blunt refusal to be compromised (Chinua Achebe) and it is lesson for all leaders, you and me inclusive. I spoke to you at that time and there was in addition evidence of cover-up and non-prosecution of fraud of fake security report against the other candidate and his collaborators. When one gives a command, instruction and order, an imperative sentence is what results. It ranges from a mild order to a harsh order or command. In imperative sentences, the subject is usually absent and the sentence begins with an imperative verb. Answer one question from each section of your examination. Leave the city at one! Follow the path to your destination. The current situation and consequent possible outcome dictate that I should, before the door closes on reason and promotion of national interest, alert you to the danger that may be lurking in the corner. We must move away from advertently or inadvertently dividing the country along weak seams of North-South and Christian-Moslem. Some of our international friends and development partners are genuinely worried about signs and signals that are coming out of Nigeria. I am concerned about your legacy and your climb-down which you alone can best be the manager of, whenever you so decide. If I could get there and if Jonathan can get there, any Nigerian can. This is a sentence that shows emotions such as surprise, excitement, anger, joy, pain and other forms of emotions. The exclamation mark usually follows an exclamatory sentence. We do not normally use the mark in formal writing; and a period does not immediately precede or follow the mark. How good and pleasant it is for brothers to dwell together in unity! How lovely upon the mountains are the feet of those who speak good tidings! What a beautiful smile the baby has got! 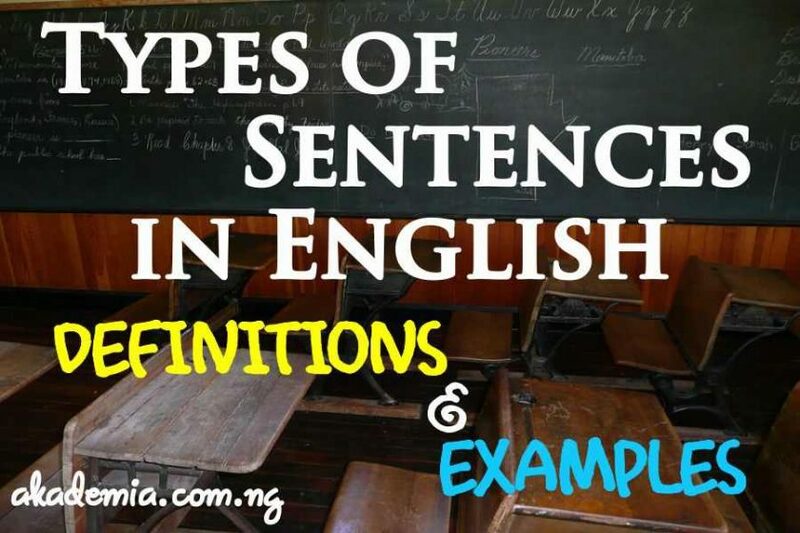 This post has explained all the possible types of sentences in English; and it is important for students of English, or anyone who loves to be sound in the knowledge of English, to be versatile in the use of these types of sentences, as circumstances may require. Please share this knowledge with others to enlighten them on types of sentences in English. Use our comment box below to send in your comments and questions. Thank you for always reading Akademia.